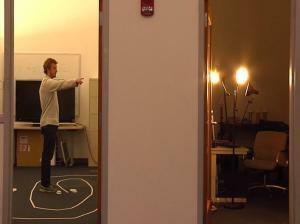 A research team at MIT has developed a system called WiTrack, which can track movements and gestures through walls and other obstructions. Set one up in your living room and it has the capability to track your movements throughout your apartment, regardless of the intervening obstacles. This has applications for video games and emergency care of course, but it could also be used for more nefarious purposes. I mean, uh, nevermind. It's cool and you should get it!